Orthodox Societies: He Changed Love Into Heaven! How wonderful is Your care, O You the Almighty! however you changed the den into paradise! who minister unto us for salvation and love and work for the sake of Your kingdom inside us! May You throw me in the den, but may You shut the mouths of the hungry lions so they would not devour me. Darius the faithful king! I am ashamed of his sincerity and his confidence in You! 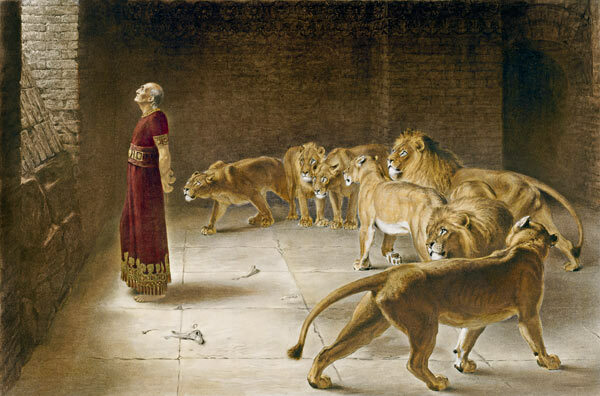 For the sake of Daniel, Darius did not eat until sunset and remained fasting until dawn. could not sleep and at dawn hurried to the den for the sake of his servant Daniel! With a sorrowful voice, he called Daniel to find out what happened to him. The God of Daniel is able to save unto the end! and for the salvation of the whole world? Do I believe that the God of Daniel is able to save? Do I give up sleeping as long as there are souls in the den of the invisible lions? Do I wake up early seeking the salvation of every soul that is drifting away?